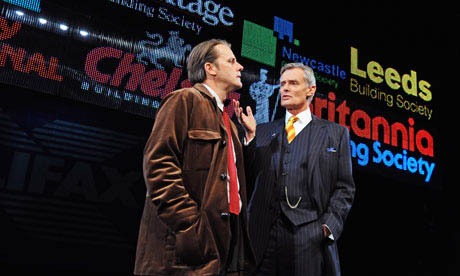 In 2009, English playwright David Hare brings on National Theatre stage The Power of Yes, a year to the day after the September 2008 crash. Could he imagine how all Western societies would be plunged into crisis four years later? Could he anticipate such a reversal where the markets "saved" by the states were called in turn to the rescue their saviors? The Power of Yes allowed to question our crisis’ genesis. The play took the challenge of exploring the abstruse mechanisms of the financial system. But to go beyond mere pedagogy, this text-survey questionned the very people that lead (or lead to believe) this system. What was their motivations? What perception do they had about the part they play in these events? The text brought testimonies often conducted, sometimes overwhelmed, by "greed, fear and complacency." It highlighted those human behaviours that still disrupt our societies. It also putted into perspective the public discourse that would almost make us accept the inevitability of these actions. The Power of Yes met this need to know, to understand a world whose logic seems elusive, bouncing from one crisis to such an extent that its founding episode - the 2008 financial crisis - now seems so distant, almost from another era. To see The Power of Yes in 2009 gave the audience, in a way the high end adjustment variable of the system, a higher conscience on the foundations of the today crisis. The play convened on stage the cynicism and inconsistency of finance actors in, but it also served as an incentive to react, respond, and speak. Is it necessary to recall how the impact of the financial crisis on the real economy and on the states debts causes great confusion in Europe and the world? The citizens see some benchmarks widely questioned, noting that the market economy they largely accepted as "the least bad system" can generate drifts out of control. They measure how much this so abstract world of finance may really impact their lives. 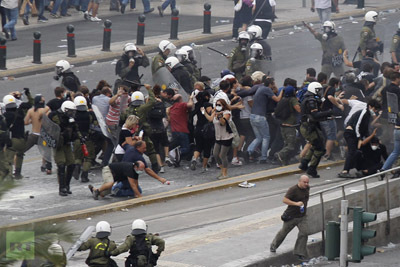 Some countries find themselves facing great social crisis scenarios (think Iceland, Ireland, Portugal, Greece ...). Difficulties spread with a domino effect, causing extreme reactions of misjudgements between citizens of different countries with respect to policy directions from other countries (one thinks of the relationship between Germany and Greece for example). It is far from the values of sharing, solidarity or even equity so often promoted by Western societies. In turn, citizens are victims and/or judges of their neighbours crises. And U.S. rating agencies, if discredited in 2008, endorse a new role of referee, awarding brownie points and blame. The "European family" offers unprecedented spectacle of irrational relationships, epidermal fed fantasies and prejudices of the individual members. How to overcome this confusion, prevent a form of fatalism? How to resist the temptations of isolationism? To attempt a response to The Power of Yes, to provoke a resonance that I think healthy, World Crisis Theatre offered to artists from different European countries to gather, with the contribution of students in Art, Politics and Economics. The project imagined to extend the David Hare proposal by writing responses: theatrical forms written by project participants inspired by The Power of Yes. A way to take the pulse of Europe's citizens facing economic and moral violence that is imposed. A response from the audience, the public, offset from the demonstration of The Power of Yes. In the spirit of these citizen movements that spread worldwide by the street, World Crisis Theatre aims to bring a response on stage in order to react to the world today.